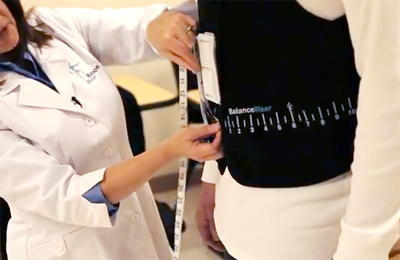 BalanceWear® enables “counter-balancing” of the body to improve postural control, alignment and balance in patients. Many older adults and those with neurologic and orthopedic medical conditions often present with such postural instability. A BalanceWear trained clinician will test you for postural directional instability. If postural instability is present, your personal instabilities are identified. The therapist will place very light (typically less than one pound, total) weights strategically at one or more locations on your trunk to enhance the stability of your trunk and counter-balance your body. When postural control is improved and greater stability is achieved, gait and balance may be improved. In such cases, improvement is seen immediately. There are three biological systems that control balance: The visual system, sensorial system and vestibular system. BalanceWear provides important information to your sensory system which has the potential to make balance corrections and improve mobility.